For results please click HERE. Update on the timing of the SPAR Streets of Dublin 5K 2018.Thank you for your participation in the SPAR Streets of Dublin 5k. As you are likely aware due to a technology issue there has been a delay in issuing results for the SPAR Streets of Dublin 5k. Athletics Ireland has worked together with our timing partners since Sunday and made every effort possible to recover participants race times. Unfortunately after recovering some times and to our great disappointment, we are unable to recover the remaining results. Unfortunately a proportion of the timing chips were encoded incorrectly and as a result the correct information (i.e. start time/finish time) cannot be retrieved from the chip when scanned. Regrettably this timing issue only became apparent once the run was finished. 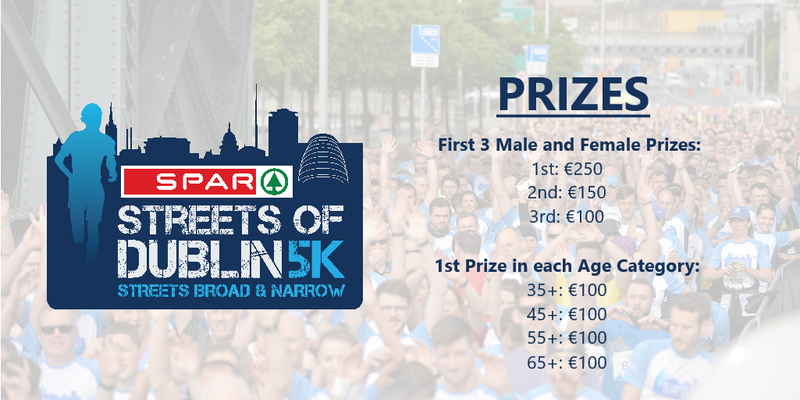 Due to some omitted and inaccurate race results from the SPAR Streets of Dublin 5K, we cannot identify the winners of the age categories prizes. We feel that the best decision in this situation is to roll over the age category prizes (Male and Female 35+, 45+ 55+, 65+) to the next event in the Athletics Ireland Race Series. This will mean that the Irish Runner 5 Mile master categories prize fund has doubled. Although we recognise this isn’t the situation we wanted, we believe it is currently the fairest decision for all our participants. Again, we would like to emphasise that we are putting measures in place to make sure this technology issue will not happen for the next two races in the Athletics Ireland Race Series and any future events. For all available results please visit our website http://www.athleticsireland.ie/runzone/streets-of-dublin/. If you haven’t received your race time or if you think your race time is inaccurate or omitted please contact Titan Sports who may be able to help you further. Please email Jason Moloney on jason@titansports.ie. Thank you. Finally, we would like to take this opportunity to thank all the participants to took part in the SPAR Streets of Dublin 5k. We appreciate your support and patience throughout this process. 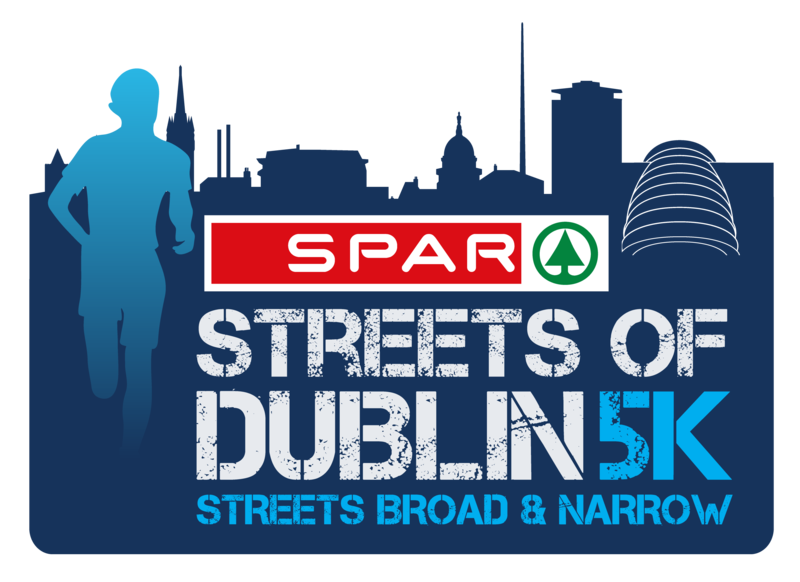 Athletics Ireland in partnership with Dublin City Council will host the SPAR Streets of Dublin 5K on Sunday 20th May 2018 @ 9am. This 5K route will take participants through the Streets of Dublin starting outside the CHQ Building and finishing on City Quay. The SPAR Streets of Dublin 5k is part of the brand new Athletics Ireland Race Series 2018. When: Sunday May 20th 2018 @ 9am. Entry Fee: €15 (plus processing fee). Online Entry: Register HERE. Online entries will close 11:59pm Friday 18th May 2018. Number Collection: Number collection will take place at INTERSPORT Elverys on Henry Street, 18 Henry St, Dublin 1 on Friday 18th May between 10:00 & 18:00, and Saturday 19th May between 10:00 & 18:00. Prizes: There are prizes for the top 3 male and female particpants who cross the finish line and also there are prizes for the winner in each age category as shown below. This is a chip timed event and all participants will receive a technical t-shirt. What better way to kick start your Sunday morning than running through the Streets of Dublin!